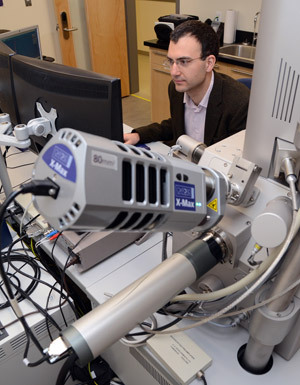 In one of many examples of research underway at the University of British Columbia’s Okanagan campus, Andre Phillion, assistant professor of mechanical engineering in the School of Engineering, uses a scanning electron microscope to conduct an experiment. Without research, knowledge about our world would stagnate, but dedicated professors and students are delving into the unknown in a quest to expand understanding of the universe around us. And many of those researchers can be found right here in the Okanagan. The University of British Columbia’s Okanagan campus has numerous continuing research projects ranging from engineers working to improve construction materials, to health-care professionals investigating ways to keep people healthier. UBC’s Okanagan campus attracts about $10 million a year in research grants. Ultimately, the public benefits from the research done in labs and classrooms. The knowledge learned on campus is transferred in many ways so it can be applied to the lives of people everywhere. Miriam Grant, vice-provost of research and dean of the college of graduate studies, says research grants play a huge role in the continuing work at the university, and in making life better for the public. “Research grants are absolutely pivotal for supporting researchers - including undergraduate and graduate students, for providing lab equipment and facilities and for funding field research regionally and across the globe,” says Grant. Many are derived from the Social Sciences and Humanities Research Council of Canada (SSHRC), Natural Sciences and Engineering Research Council of Canada (NSERC) and the Canadian Institutes of Health Research (CIHR). Those grants facilitate advancements in the areas of study as well as allow researchers to share their knowledge with their colleagues, which in turn benefits the public. Graduate students are also supported through the research funds, and Grant says many of them carry on with their education once the research is complete. The grants also allow researchers and some students to travel to continue their research, or to present their findings. Projects underway at the Okanagan campus range from using waste material in concrete, rather than clogging up landfills, to research on concussions, which will benefit athletes in all sports. Private companies also provide research money for work on specific projects. One such project involved a graduate student who spent the summer working on algorithms for high-tech goggles and visual display hardware that provide a plethora of instant information to the user. Heinz Bauschke, professor of mathematics with the Irving K. Barber School of Arts and Sciences, holds the CRC in Convex Analysis and Optimization. Barb Pesut, assistant professor in the School of Nursing, holds the CRC in Health, Ethics and Diversity. Phil Ainslie, associate professor in Health and Exercise Sciences, is the most recent CRC, named last autumn for his research in Cerebrovascular Function in Health and Disease. Susan Murch, associate professor of chemistry with the Irving K. Barber School of Arts and Sciences, is CRC in Natural Products Chemistry. “Research chairs are leaders and they bring high levels of research activities to the university,” says Grant. A CRC will also attract the best and brightest students to the field of research. The university is also home to several post-doctoral fellows. Gord Binsted, acting dean of the Faculty of Health and Social Development, which includes the schools of Nursing, Health and Exercise Sciences and Social Work, says there are many roles for universities to play in furthering research. For the schools within the Health and Social Development, the goal is to help people live healthier lives, benefitting from research that ranges from advancing medical techniques to teaching people how to take better care of themselves. Binsted says the core of research is the discovery and application of knowledge. Often research must take many baby steps before a major breakthrough can be achieved. Wisdom Tettey, dean of the Faculty of Creative and Critical Studies (FCCS), says professors and students are active in a variety of research initiatives. FCCS incorporates these tenets into academic programs and experiential learning opportunities for students, at both the graduate and undergraduate levels. An important part of the faculty’s scholarly commitment is to ensure research, scholarship and creative pursuits are responsive to the fundamental questions and issues that require critical interrogation, have resonance, and are transformative. how language, literature and intercultural communications shape, and are shaped by, particular historical contexts. The School of Engineering, part of UBC's Faculty of Applied Science, has successfully competed for nearly $14 million in research funding for current and growing research endeavours. This has enabled purchases of new equipment to create world-class facilities, to support research assistants, and to attend conferences to disseminate research results and foster collaboration with various research groups and industry. The majority of funding has come from NSERC through competitive programs including Discovery, Strategic Project, Idea to Innovation, Research Tools, and Instruments and Engage. Funding from the Canadian Foundation for Innovation and the BC Knowledge Development Fund totalling nearly $5 million was instrumental in helping the school acquire the equipment necessary to establish leading-edge facilities for experimentalists. An allotment of $550,000 from Genome BC and Western Economic Development has funded the establishment of the Integrated Research and Machining Centre. The School of Engineering is an integrated multidisciplinary faculty with many projects that involve more than one of the traditional engineering disciplines of civil, electrical and mechanical. The Composites Research Network (CRN) is being created by the federal government to assist Western Canadian manufacturing businesses in developing the necessary skills and expertise to compete for opportunities in the rapidly expanding global composites industry. Abbas Milani, assistant professor with the School of Engineering, will work with local companies and employ research tools for CRN projects at the Okanagan node in a range of applications in transportation, construction, sports and leisure, and other industries. The activities of the Okanagan node under Milani’s co-ordination will be part of CRN’s higher mandate to create knowledge-based, best-practice documents, training facilities, materials and events for its participants, as well as links to key national and international organizations and institutions. Don Tamaki, production manager for Campion boats, says the partnership with the CRN will help the company make a better product. “The CRN is going to give us the opportunity to work with the university and to be able to test our methods and materials we are using to help us built better-quality boats,” says Tamaki. Business is everyone’s concern and the Faculty of Management research focuses on areas where business interacts with ethics, sustainability, stewardship, branding, innovative human resource practices, the globalization of consumerism, e-commerce, fair trade and organizational behaviour in a changing workplace. Management research is developing models, tools, and systems of quantification that are critical to understanding the modern business world. Faculty and student research produces results of direct benefit to the local community. Through a variety of projects, synergy is developing between the Faculty and area businesses, allowing for free exchange of ideas and innovative solutions. The “What Makes a Great Employer?” tradeshow was hosted by Assistant Professor Luc Audebrand and his class at the Coast Capri last fall. Local businesses and human resources specialists were presented with in-depth studies of a variety of employer-related issues by the students, and were asked to evaluate their research and ideas. “Road to Change: Moving beyond Growth” was another of Audebrand’s class offerings to area companies, providing research-based proposals for corporate development in a post-growth economy. Annamma Joy, professor of marketing, sent her students into the community to research local marketing strategies and brought business leaders into the classroom to share their practical knowledge. . The Faculty of Education is an interdisciplinary community that includes researchers with expertise in diverse areas such as policy, historical imagination, literacy and culture education, inclusion, pedagogies of critical and creative thinking, appropriate technology, teacher professional development, and the scholarship of teaching and learning. This includes inter-professional research with engineering, social work and health professions within the UBC community; research involving regional and national colleagues focused on leading-edge initiatives including 21 Century and personalized learning; and local initiatives related to equity and diversity that collaboratively transform educational practices and outcomes in classrooms, schools and communities. Much of this work is international. For example, Associate Professor Susan Crichton’s research takes into consideration that ‘less is more’ in her focus on sustainable development and uses of technology in remote places such as rural East Africa. Assistant Professor and director of the Centre for Research on Mindful Engagement Philip Balcaen’s study on how students influence their parents’ ‘thinking about thinking’ is central to an inquiry into educational change in India that is providing new insights into how we might approach change in North American education=. A key focus of Assistant Professor and director of Undergraduate Programs Carol Scarff’s research with colleagues in New Zealand is the long-term impact of environmental education experiences on young people. The Faculty of Education is currently developing research initiatives to study and advance understandings about place-based and practical-wisdom oriented programs, both within a range of formal educational settings and by engaging with the broader community. For instance, Assistant Professor Leyton Schnellert is partnering with Okanagan school districts to re-imagine educational practice and conceptions of teaching, learning and learners using strength-based and interdisciplinary approaches to literacy learning, inclusion and middle years education. Assistant Professor Scott Douglas’ program of research supports English as an Additional Language curriculum and materials design for both domestic and international English language learners. Research is a key element of the Irving K. Barber School of Arts and Sciences, forming an integral component of the undergraduate and graduate student experience and of faculty scholarly activity within eight distinctive units. The school has more than 50 academic programs encompassing humanities, social sciences and sciences. The Irving K. Barber School Undergraduate Research Awards program is an example of the importance placed on enhancing the research experience for undergraduates. It offers a unique opportunity for undergraduate students to become involved in research via student-driven summer research projects guided by faculty mentors. The faculty supports more than 200 graduate students pursuing master's and doctoral degrees, providing opportunities for disciplinary and interdisciplinary learning and research. Arts and Sciences researchers attract more than $4.5 million annually in grants which support a diverse portfolio of research, two Canada Research Chairs, two research chairs in watershed management and research collaborations with community, industry and government partners. A number of emerging clusters of research strength address key aspects of UBC’s strategic plan, Place and Promise, in the areas of global citizenship, sustainability, Aboriginal engagement, and civil society. In February, the Centre for Advancement of Psychological Science and Law (CAPSL) officially opened at the university. CAPSL researchers include Assistant Professor Zach Walsh, Associate Professor Mike Woodworth, and Professor Stephen Porter. The types of research conducted at CAPSL, which is funded by the Canadian Foundation for Innovation (CFI) and the BC government, is relevant to the basic understanding of the psychology of crime and victimization, and to the types of biases that can influence decisions about suspects and defendants in the legal system, sometimes leading to wrongful convictions. This could help to improve the criminal justice system.